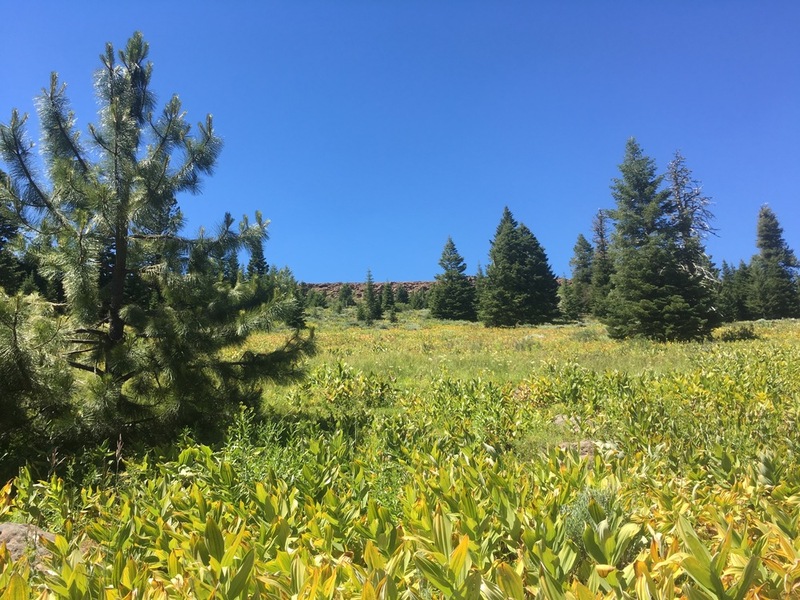 Description: This hike goes through a diverse landscape of scablands, forests, and meadows that ends at the top of Spanish Peak. 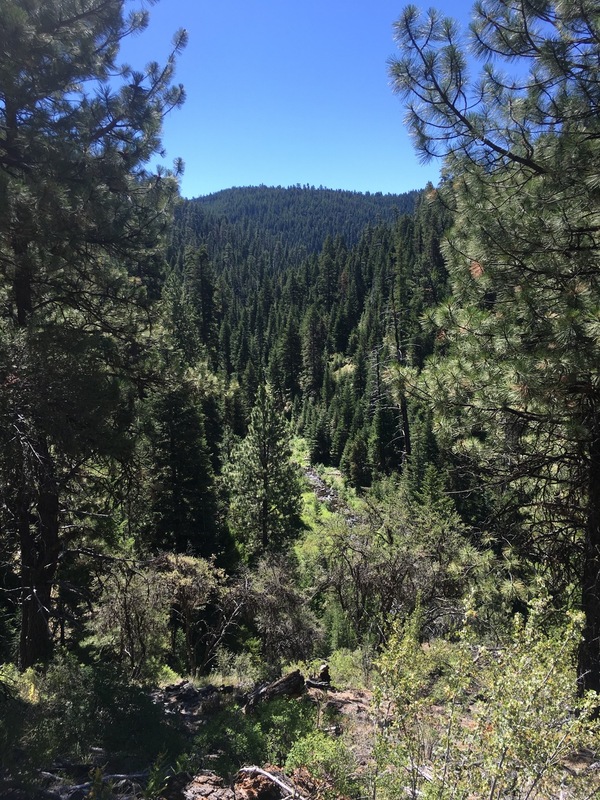 At the summit there are sweeping views of the entire Ochoco Forest and Cascades. In the spring and summer there are vibrant wildflowers and butterflies as well. 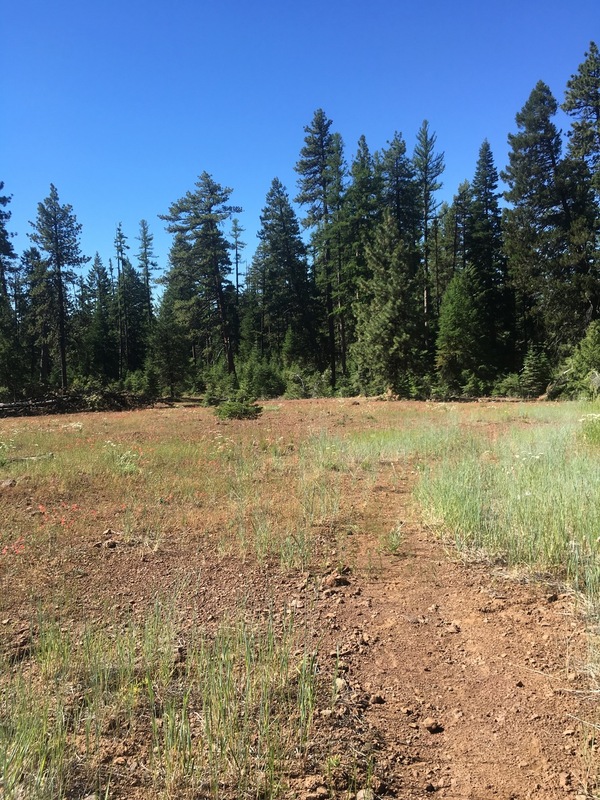 Begin at the Mascall Corrals Trailhead for Mascall Corral Trail #817. Follow this trail up through an open scabland (this may sound bleak but scablands have beautiful wildflowers and unique ecosystems). The trail can be difficult to find through here but there are many be trail marker diamonds on trees, so keep an eye out for those. About 3/4 of a mile into the hike the scenery turns into a forested area scattered with open meadows. At the first meadow (mostly covered with Corn Lily), take a slight left and continue up into a densely forested area. This turn is marked by diamond trail markers on an old growth fir tree but the trail is barely visible. Once within the dense forest, the shade can be a welcoming relief from the beating summer sun that shines down without obstruction on the scabland. The trail starts to incline here. 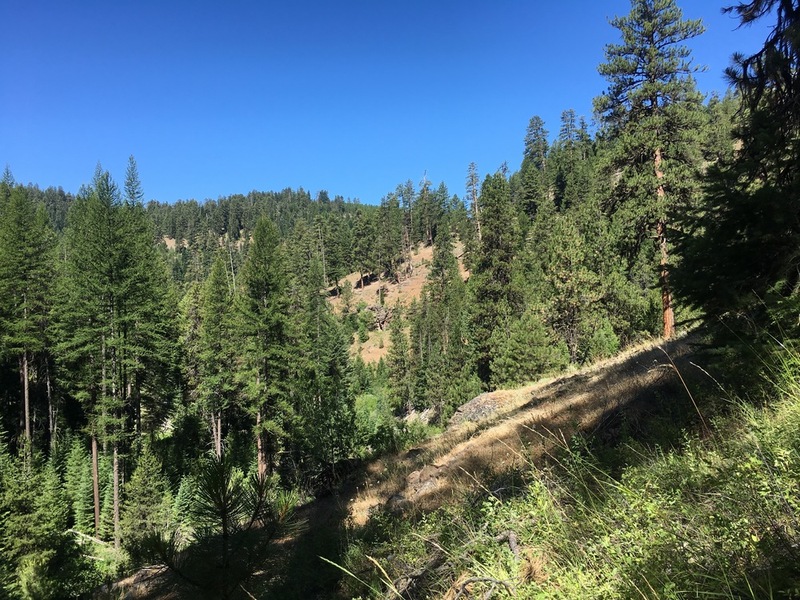 Continue about another 1 1/4 miles up the trail until the trail junction for Mascall Corral Trail #822 and Rock Creek Trailhead. At the sign, continue right on the trail. The trail gets difficult to follow after this point; however, there are frequent trail marker diamonds on trees or cairns on the ground with wooden posts protruding from them. Mascall Corral Trail #822 ends a mile up the trail. After the trail ends, take a left on the road and walk the mile up to the top of Spanish Peak. 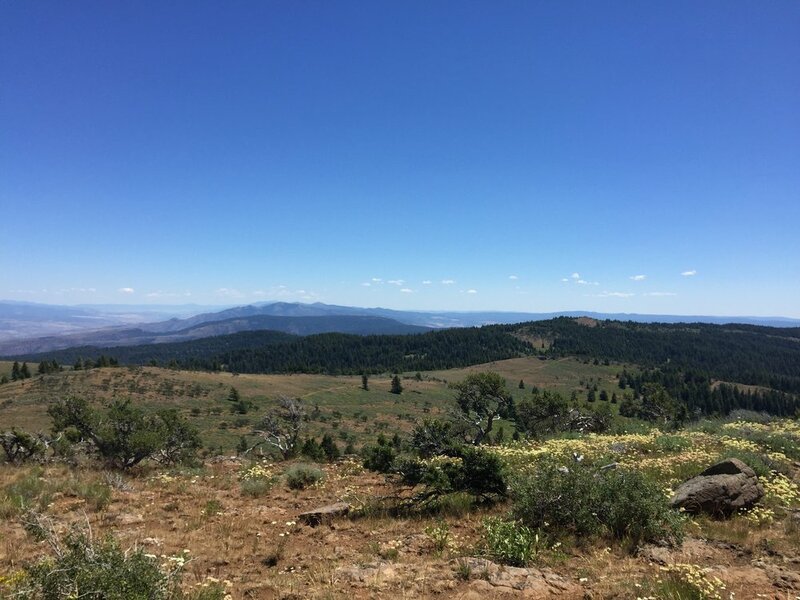 At the top there are beautiful views of the entire Ochoco forest, the surrounding John Day area, and the Cascades. The peak is a great place to stop for lunch, after finishing continue back down the same way as coming up. Directions from Bend: Begin on US-97 N toward Redmond/Portland. Continue on US-97 N for about 15 miles. Turn right on OR-126/SE Evergreen Ave. Follow OR-126 for about 17 miles. OR-126 becomes NW 3rd St/US-26 E. After about 1.5 miles turn right onto SE Combs Flat Rd/OR-380. Continue on OR-380 for 47 miles. Stay straight on Paulina Hwy for about 8 mile. Paulina Hwy becomes Paulina Suplee Hwy. Continue east on this Hwy for 3.5 miles to County Road 113 (Beaver Creek Road). Turn left (north) onto Beaver Creek and follow for 7.5 miles until Forest Service Road 42. Continue on Forest Service Road 42 for 1.5 miles then take Forest Service Road 3810 for 7 miles. At the end of Forest Service Road 3810, turn right (east) Forest Service Road 38. Follow Forest Service Road 38 for about 4 miles. Turn left onto Forest Service Road 3820 and follow it for 2.3 miles. The trailhead will be marked on the left. Drive a bit further to an open campground site were there is plenty of parking. Description: This hike is for those adventurous souls who are not afraid of a little bushwhacking. While this is an established trail with trail markers, the trail does not appear to have been cleared in years. With all the dead and down trees, it is next to impossible to follow the trail that was originally created. So for those who crave secluded adventure this is the hike to take! 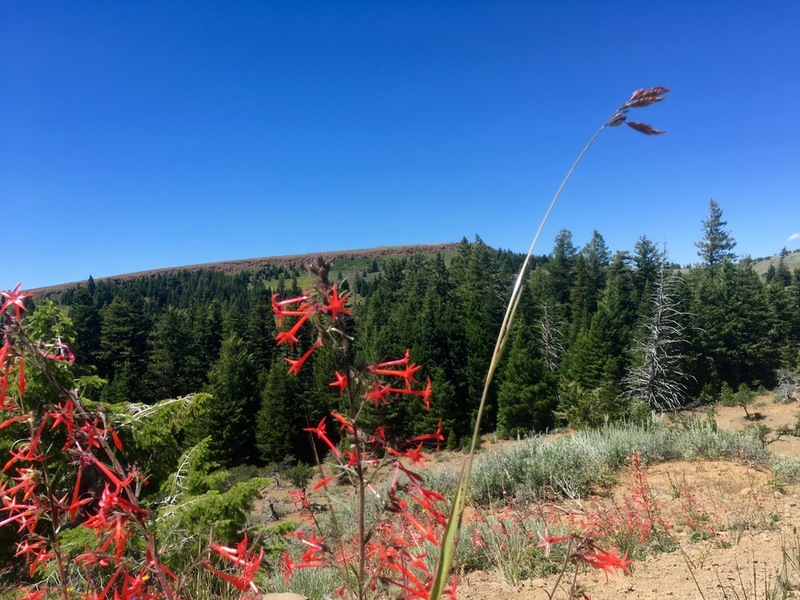 The hikers who embark on this adventure are rewarded with historical knowledge of the area through the interpretive sign at Watermans Ditch, beautiful views of Rock Creek, wildflowers, and a crumbling ditch diggers log cabin at the end. The Ochoco Mountain Trail #823 begins at Rock Creek Trailhead. The first .4 miles down to Rock Creek has the worst of the dead and down trees on the trail. At the creek, there is a nice wooden bridge to take in the sparkling creek and fish swimming below. Follow the trail on the other side of the bridge along the bubbling Rock Creek. Waterman's Ditch is reached about 2.4 miles into the hike. On the hikers left there is an interpretive sign giving the history of the ditch. 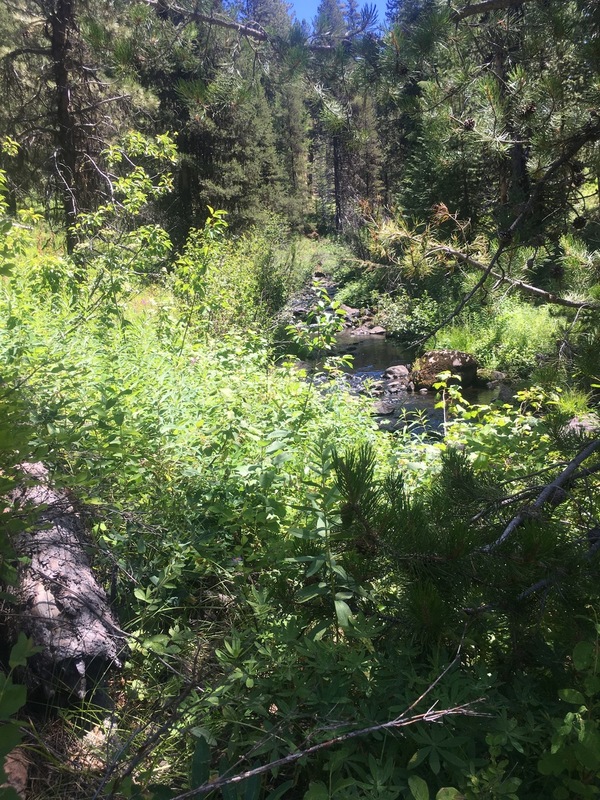 In another 1.4 miles the trail reaches Fir Creek, take a left shortly after crossing the creek and the Ditch Diggers' cabin will be on the right. This is a good place to turn around and head back to the trailhead. The trail does continue all the way to Spanish Peak but that is about 11 miles in one direction. Directions from Bend: Begin on US-97 N toward Redmond/Portland. Continue on US-97 N for about 15 miles. Turn right on OR-126/SE Evergreen Ave. Follow OR-126 for about 17 miles. OR-126 becomes NW 3rd St/US-26 E. After about 1.5 miles turn right onto SE Combs Flat Rd/OR-380. Continue on OR-380 for 47 miles. Stay straight on Paulina Hwy for about 8 mile. Paulina Hwy becomes Paulina Suplee Hwy. Continue east on this Hwy for 3.5 miles to County Road 113 (Beaver Creek Road). Turn left (north) onto Beaver Creek and follow for 7.5 miles until Forest Service Road 42. Continue on Forest Service Road 42 for 1.5 miles then take Forest Service Road 3810 for 7 miles. At the end of Forest Service Road 3810, turn right (east) Forest Service Road 38. Follow Forest Service Road 38 for about 3.5 miles. Rock Creek Trailhead will be on your left near Potter Meadow.